Ventilation Pipe Systems, Industrial Hoses & Drainage Pipework to UK Industry. At £3.99 for 2-3 working day and £5.99 for next working day delivery, including pipe lengths, we do not profit from any of our delivery costs; if anything we provide this at less than cost price. Costly delivery to residential properties and Highlands and Islands has always been an issue for 5m and 6m pipe lengths, and so we have recently resolved this by giving customers the option of having their plastic pipe cut into shorter lengths (a free service), which enables us to use a small van carrier rather than a large truck. 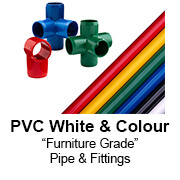 Industrial Pressure PVC (PVCU/UPVC), ABS and CPVC Plastic Pipe Systems: including pipes, fittings and accessories. 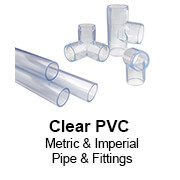 We supply metric mm ranges (PN6, PN10 & PN16), UK imperial inch ranges (Class C, D, E & T), USA imperial inch ranges (Schedule 40, 80 & 120) and clear PVC pipe ranges, in both metric and imperial. 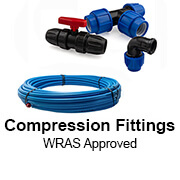 In addition, all our PVC and ABS pressure pipe and fittings are WRAS approved, and our Griffon and Tangit ranges of solvent cement are also WRAS approved and conform to BS4346-3. 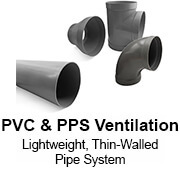 PVC (PVCU/UPVC) and PPS Ventilation and Ducting: where we supply the full range of Hoka and Beck plastic ducting fittings, as well as PPS and PVC thin-walled lightweight plastic pipe to match. 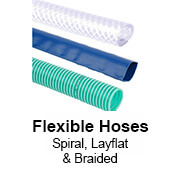 Flexible Hoses and Connectors: where we supply a range of high-quality PVC and other plastics spiral suction and delivery hoses and tubes, layflat hose, clear braided hose and a range of couplings to match. 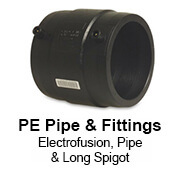 PE Pipe and Fittings: This is split into two ranges; the first being blue water pipe (sometimes referred to as alkathene) and compression fittings, and the second being GPS Black PE100 pipe, Electrofusion (EF) and long spigot fittings. Furniture Grade Plastic Pipe and Fittings: Specially manufactured PVC with a shock resistant formula that produces a range of white, black and coloured products ideal for making frames, pool and medical furniture and a myriad of other projects. Which Type of Plastic Pipe Do You Need? Most older PVC pressure pipe systems in the UK are installed in inch sizes, as before the 1990s that was all that was available. More recently, however, metric systems have been gaining popularity as there is a wider range of fittings available. It is recommended that expansions to existing inch systems are carried out using inch sizes to avoid confusion. Inch PVC pressure pipe is typically used in process lines in factories, swimming pools and aquaculture. PVC pipe is very easy for non-skilled workers to install, with no special tools and only a small amount of training required. 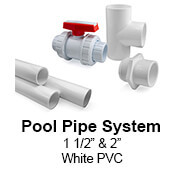 With the exception of 2½", all plastic pipe sizes in the North American Schedule 40 and Schedule 80 pipe systems are compatible with the inch sizes you will find in the UK, so the fittings and pipe are interchangeable. The exception is where threads are involved; the North American systems will generally use NPT threads, which are not compatible with the BSP threads used in the UK and Europe. 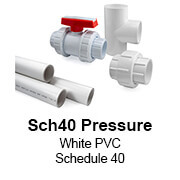 Applications for Sch40 pipe are much the same as above; however, as it is manufactured in white PVC as standard, some installers prefer to use it in high hygiene and food processing applications, as it is easier to notice dirt build up. As with the inch sizes above, Sch40 pipe is solvent welded and so easy and quick to install. 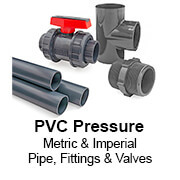 The use of metric PVC in the UK is a relatively recent occurence and started primarily because of the irrigation industry, for which many parts came from Europe. It is now firmly established in the UK and accounts for about 50% of all new PVC pipe systems installed. Still the standard of choice in agriculture and irrigation, it finds favour in many other applications (process lines, water treatment, fish farming etc.) because it has a larger range of sizes and also a wider range of fittings available. The solvent weld process of connection for metric PVC pipe makes installation very fast and straight forward. Clear plastic pipe systems are only available in PVC material. At present, only the inch sizes have a range of fittings available to match, with metric availability being limited to pipe only. Metric clear pipe is substantially cheaper than inch sizes as it is manufactured in options with thinner walls, which means less material needs used and so the cost is lowered. Clear plastic pipe is most often used for viewing liquids in process, building demonstration units or as sight glasses. Like all PVC plastic pipe, the clear pipe is built using a painted-on cement to both the pipe and socket, although care must be taken not to let cleaner or glue splash or run down the pipe as it will affect the clarity. As well as having a different chemical compatibility profile to PVC, ABS has a different ductility profile. This makes it the plastic pipe of choice for systems that use a cold or below freezing fluid, such as glycol circuits, ice cream factories and ice slurries in fish plants, as the pipe is far more robust than PVC at these temperatures. ABS is also often used in the brewing industry. If required, ABS can be cemented to PVC as long as PVC pipe cement is used; however, our recommendation for this type of join would be maximum pressure of half that of the normal working pressure. 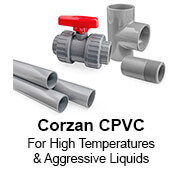 CPVC or ″Corzan″ is used where plastic pipe is required and the temperature is higher than that which can be handled by PVC or ABS (60°C and 70°C respectively). CPVC will handle up to 85°C and even as high as 95°C for short periods. CPVC also has a higher chemical resistance than standard PVC and so is used in harsh applications. Installation is by solvent weld. Threads are advised to be kept to a minimum. This is because plastic pipe has a coefficient of expansion two to three times higher than metal pipes, and so when the temperature of a CPVC system is heated up or cooled, seals in threaded connections can break, leading to leaking. This is a system of thin-walled, large diameter plastic pipe and is used for ventilation and ducting in areas where there is a high risk of corrosion of standard galvanised spiral ducting. Applications include swimming pools, public aquariums, shipping and clean room facilities. The lightweight nature of this pipe and its ability to be easily painted also make it a favourite for set design and prop construction. Joining of PVC vent pipe is by solvent weld or flanges, although some installers prefer to hot air plastic weld it. PPS is often confusing and people think it is an abbreviation for a type of polypropylene, but in fact it is polyphenylene sulfide, which has very different properties. Its advantages over PVC for ventilation and ducting are that it has a much higher operating temperature (200°C as opposed to 60°C) and it does not build up static electricity. The latter of these makes it the material of choice for the semiconductor and aerospace industries, where it is most widely used. Other uses include industrial fume extraction. Unlike PVC, PPS cannot be joined by solvent welding and most installers use silicone or other mastic products. Supplied in either blue or black, only the blue pipe has a WRAS approval for potable (drinking) water. MDPE is the choice plastic pipe for long runs of small-bore pipe <63mm. It is supplied in coils and is very tough, meaning that it can be buried. It is the main type of plastic pipe used in domestic water supply in the UK. A limitation of all types of PE pipe is that it cannot be cemented or glued, so compression fittings must be used. The compression fittings are much longer than an equivalent PVC or ABS pipe fitting and this, combined with the higher flexibility of the pipe, makes it unsuitable for more complex pipe arrangements. This is a specially manufactured PVC using a formula that greatly increases the ductility of the plastic pipe and fittings, making it shatter proof and strong enough to build structures and furniture from. It is not suited to applications for fluid transfer as the fittings are not pressure rated or tested to WRAS drinking water conformity. PVC pipe should under no circumstances be used for compressed air. This is because when it shatters, the pipe splinters into many pieces, and as compressed air escapes from the break point, shards could come flying out and cause a health and safety risk. ABS and MDPE pipe are safer options for compressed air as they split and do not cause such a hazard. PVC pipe can be used for low pressure air up to 0.5 bar from blowers, but should never be connected to compressors. 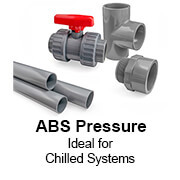 Plastic Pipe Shop Ltd are a leading UK stockist and distributor of industrial PVC, ABS, CPVC and PE pressure pipe and fittings, and PVC and PPS Ventilation Pipe Systems. As one of the very early adopters of online shopping cart systems, we have been supplying industrial plastic pipe systems both on and offline since 2004. Our sales team are very highly trained in technical aspects and many are either past professional pipefitters or plastic pipe system designers. This enables us to provide sound and practical advice - if you're trying to fit a square peg into a round hole, our guys have probably tried before and can tell you how to best manage it. Another way that we differ from most of our online competition is that we have our own warehouse and hold our own stock of PVC and other plastic pipe systems, which we import directly from manufacturers in Europe and Asia. Sadly, very few PVC, ABS or other pressure pipes and fittings are manufactured in the UK these days; however, we make sure that we regularly visit all our suppliers, wherever they are in the world, to assure ourselves that they are manufacturing to the correct specifications and have a consistency of quality. Since launching our online store back in 2004, with just a small, basic range of plastic pipe and fittings, the internet and people's use of it has changed dramatically. Here at Plastic Pipe Shop Ltd, we have grown with the internet, through introducing a customer feedback system that now has over 700 reviews (with over 98% positive), quick order forms, a quote generator facility, a properly functioning part number search facility and also our blogs and YouTube instructional and product videos. Our aim online is not to be the most fancy, trendy, up-to-date website, but with over five thousand plastic pipe related products, is to provide an easy to navigate, intuitive site, which gives you the information you need without all the flannel! In recent years we have also produced a printed plastic pipe systems catalogue - it's all well and good having everything online, but more often than not thumbing through a catalogue is still a lot quicker and easier! If you'd like one, just email or ring us and we'll send one out to you. 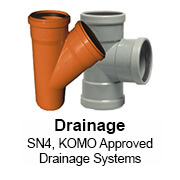 Our aim is to supply a correct specification of plastic pipe and fittings. As well as stocking our own ranges in our warehouses, we also ship direct from, and have excellent relationships with, most of the main plastic pipe system manufacturers' warehouses throughout the UK. These include Effast, Plimat, Cepex, Spears, Hoka, Beck, Durapipe and GF. If you require a specific manufacturer's parts, be it PVC, ABS, PE pressure or ventilation, we can quickly source them for you at a very competitive price. This flexibility enables us to supply you, the customer, with BS and DIN spec rated parts (always produced in ISO 9001 facilities) that will perform the task you require to finish the job, even if they are out of stock at one or more suppliers. We know EXACTLY what it's like to be in the middle of a plastic pipe fitting job and, even with the best planning in the world, find that you are short a couple of components. We have recently started a relationship with a North American manufacturer to bring furniture quality (which means nice and shiny as well as practical and functional!) PVC pipes, tubes and fittings to the UK, and now hold stocks of these at our main warehouse for next working day delivery to 99% of the UK. The range includes several neat fittings such as 3-way and 4-way corners, crosses and slip tees, as well as different colours. Go into any DIY store in the USA and you will find a whole aisle full of plastic pressure pipe. In North America, it seems that PVC pipe in particular is used for lots of different types of plumbing, both around the home and in industry. In the UK, it is a completely different story. Pressure pipe is only really used in industrial applications, and until recent years the quest to find a stockist of plastic pressure pipe proved fruitless as there were so few companies that stocked it. With the advent of the internet and next day shipping to most parts of the UK, it is now a lot easier to find. We are one of the few stockists of PVC, ABS and other types of industrial pressure pipe in the UK, and although located in Stirling, can send pipe lengths and boxes of fittings to someone at the other end of the country as easily as someone just down the road. So the question of "Where can I buy pressure pipe in the UK" has been answered. If you are not sure which type of pipe, material or fitting you require then our technical staff will do their best to help you and show you the best way to tackle your job.